For practical purposes, the e.m.f. of a cell may be measured to a very close approximation by taking the reading of a high-resistance voltmeter connected directly across the cell terminals when the cell is not connected to anything else. The reason why this value is only approximate will be explained at the end of this section, but for the time being we shall ignore the slight error. Let us suppose that a voltmeter connected to the terminals of a dry cell of internal resistance 2.0 n gives a reading of 1.5 V. This is the e.m.f. of the cell (Fig. 35.9 (a)). A 3.0 n resistor is now connected to the terminals of the cell so that the cell drives a current through it. It is noticed that the voltmeter reading has dropped to 0.90 V 0(Fig. 35.9 (b)). The cell now appears to have “lost” (1.5 – 0.90) = 0.60 V. This may be explained as follows. The current flowing in the circuit is given. open-circuit may be assumed equal to the e.m.f. E of the cell. When the cell is sending current through an external resistor the voltmeter gives the terminal p.d. V which is the p.d. required to send the current through the external resistor. The terminal p.d. 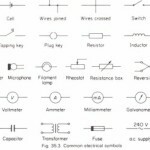 is always less than the e.m.f., and the difference between them, or “lost volts”, represents the p.d. 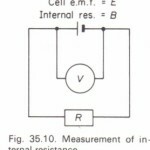 required to send the current through the internal resistance of the cell. 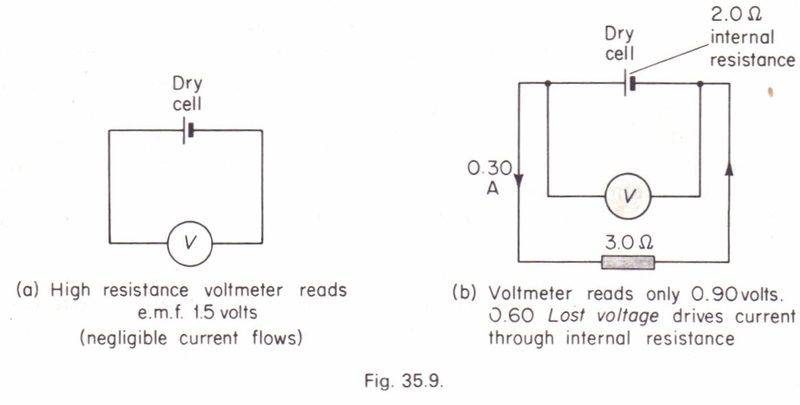 This cannot be read directly from a voltmeter, but can be obtained only by subtracting the terminal p.d. from the e.mf. We are now able to explain why a voltmeter gives only a close approximation for the e.m.f. of a cell. Even a very high-resistance voltmeter must take some current, and hence a small part of the e.m.f. will be “lost” in driving this current through the cell. 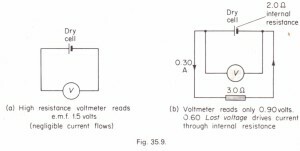 If, however, the voltmeter resistance is very high compared with the cell resistance the current taken will be very small, and consequently the “lost volts” in this case will be negligible. For the measurement of e.m.f. to a high degree of accuracy a potentiometer is used (page 459).